31+ Years Retail Mattress Business Operation - Industry Power BUYERS! Your choice of TEN mattress models in sets, all sizes, in stock NOW at the LOW LOW Prices Below! 10 Queen Mattress sets between $199.99 to $399.99! 10 King Mattress sets between $279.99 to $499.99! Huge In Stock Inventory - BUY TODAY - SLEEP TONIGHT! PICK UP OR DELIVER TODAY! Enjoy the Comfort & Support of a New Mattress at the Guaranteed Lowest Prices in North Charleston, Ladson & Charleston, SC. 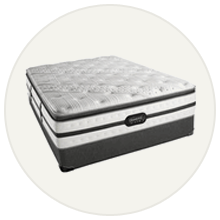 We stock and sell the best AFFORDABLE MATTRESSES in North Charleston, SC . 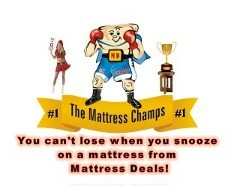 You cannot lose when you snooze on a new mattress from MATTRESS Deals! Come visit us today to preview and feel test our quality mattresses at the guaranteed lowest prices in North Charleston, Kiawah Island, Johns Island, James Island, West Ashley, Summerville, Moncks Corner, Ladson, Charleston and the entire Low Country. We carry the brands you know and trust. 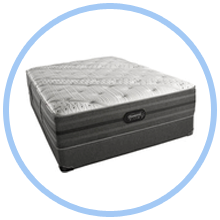 We also offer a wide assortment of mattresses from the best local and regional manufacturers who are very eager to provide you fine quality mattresses comparable to the brand names at low budget pricing. Stop by one of our store locations today to allow one of our mattress specialists educate and assist you in selecting your next memory foam mattress. We don't spend millions of dollars like the big box multi-chain mattress for advertising. Our low advertising budget allows us to sell new mattresses for MUCH less. Visit Mattress Deals before you make your next twin mattress purchase. You will not regret the time spent with one of our sleep specialists. Mattress Deals 31+ years of operational experience has provided the ownership and management team the knowledge and experience to establish and secure solid vendor relationships throughout the United States. Our manufacturing partners low pricing of new mattresses sold to Mattress Deals allows us to pass through savings to our customers. We are proud to provide customers with the guaranteed lowest prices on new mattresses and new mattress sets in the North Charleston, Greater Charleston and the Low Country areas. Buying a new mattress from a mattress store is a major investment and something that you do perhaps four or five times in your lifetime. Let our mattress sleep specialist professionals educate you so you informatively arrive at the optimal purchasing decision. 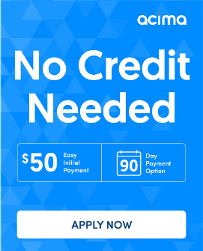 From lowest guaranteed prices to 60 nights in home sleep trial comfort guarantees, you receive a fair deal on your next mattress purchase at Mattress Deals. We are the ONLY retailer in the area that offers a QUEEN SIZE mattress with inner-spring double-sided plush 9-inch-thick queen mattress SET for $199.00. We also offer a QUEEN SIZE innerspring 10-inch-thick plush Euro pillow-top set for $299. 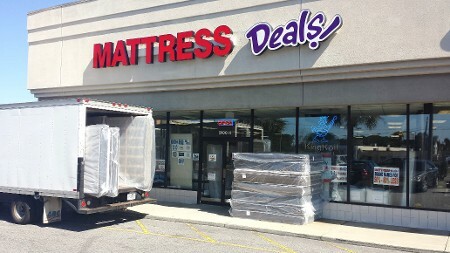 Visit us at Mattress Deals before you buy your next new mattress. Mattress Deals 31+ years of operational experience have provided our ownership and management team with the knowledge and experience to establish and secure solid vendor relationships throughout the United States. Our manufacturing partner's low pricing of new mattresses sold to Mattress Deals allows us to pass through savings to our customers. We are proud to provide customers with the guaranteed lowest prices on new mattresses and new mattress sets in the North Charleston, Greater Charleston and the Low Country. Buying a new mattress from a mattress store is a major investment and something that you do perhaps four or five times in your lifetime. Let our mattress sleep specialist professionals educate you to enable you to arrive at the optimal purchasing decision. From lowest guaranteed prices to 60 nights in home sleep trial comfort guarantees, you receive a fair deal on your mattresses. We are the ONLY retailer in the area that offers a QUEEN SIZE inner-spring double-sided plush 9-inch-thick queen mattress SET for $199.00. We also offer a QUEEN SIZE innerspring 10-inch-thick plush Euro pillow top mattresses for $299. Is it time to update your bedding? Do yourself a favor and stop by Mattress Deals to check out our constantly updated new mattress selection. Save money and time shopping our mattress store which is loaded with name brand new mattresses at 50-80% off regular retail prices. 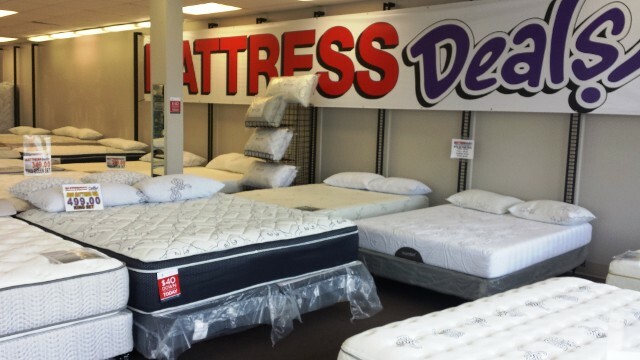 For more than 31 years, Mattress Deals owners have sold national name brands at deeply discounted prices. Come visit our mattress store to be educated by one of our seasoned and knowledgeable mattress store professionals. HHe or she will assist you in selecting the best new full size mattress that fits your budget. Choose from a large inventory of in-stock new mattresses of all sizes. We stock and sell new mattresses and new mattress sets in all sizes meeting every budget. 30 queen new mattress sets at 1099.00 or less! 10 queen sets 399.00 or less! 30 king mattress sets from 1299.00 to 279.00! Our mission is to provide quality life-enhancing sleep products at the absolute guaranteed lowest prices. Mattress Deals is extremely proud to be recognized as a leading retailer of trusted name-brand mattresses, pillows and metal bed frames. Our prices are generally 50%-80% less than our competitors for similar trusted name brand products. We are confident that you will not find lower prices anywhere else. 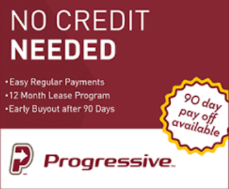 Our owner has made this commitment to you through his price guarantee offer. If you find the same new mattress set you purchase from Mattress Deals store anywhere else in North Charleston, Charleston or the Low Country in a bricks and mortar store within 30 days after your purchase for less, Mattress Deals will refund you 120% of the difference. You must provide proof. (Come to our mattress store for new mattress details). WE OFFER Same-Day Delivery for IN STOCK MERCHANDISE. Thank you for your interest. For questions or comments, please use the information listed herein. We look forward to hearing from you soon. North Charleston, Charleston, Charleston County, Berkeley, Dorchester, Colleton, & Orangeburg in South Carolina. Call us if you are not in our service area and we will do our best to accommodate you.